1. “Oh, do you know who your real parents are then?” Barring the rare occasion of a bad adoption/family, our adoptive parents ARE our real parents, just like the people who raised, nurtured, fed, clothed, cared for, and loved YOU are your REAL parents. 2. “Do you speak Korean?” Hm. We were mostly adopted when we were babies by parents who only speak English (or whatever language is spoken in the country where we grew up). So, no, we do not speak a foreign language just by virtue of our race. 3. “Are you from North or South Korea?” First, why does this matter? Will it dramatically change your perception of my adoption? Second, do you know what the Korean War is? Not many people have come in and out of North Korea for a while now. 4. “Oh! You must feel really lucky!” or alternatively, “How sad for you!” I do feel lucky, but not for the reasons you are probably exclaiming. I’m lucky because I have an amazing nuclear and extended family, and some really wonderful friends. For this reason, I’m not a sad person, although I still have feelings to process about my unique childhood. However, I’m pretty sure you think I’m lucky to be taken away from Korea because you envision it to be some third world country. It is not, and in some ways is even more modern than where YOU are from. 5. “Do you wish your birth parents had kept you?” or “Are you going to search for your real parents?” See #1, above. I think this is such an absurd and invasive question to ask. I think it’s hard for any person to imagine their life another way… Also, for adopted people, whether transracial, international, or domestic, a birth parent search is an emotional and often difficult process which requires a lot of thought. Asking this question with such casualness is disrespectful to the adoptee who must find the mental energy to ask it of themselves. 7. “Wow, it must’ve been really hard to find other Asians to date while you were growing up!” Yes, growing up in Arizona, there were very few Asians in my tiny hometown. It’s a good thing it’s no longer legally mandated for me to date within my race! 10. “Will you adopt a baby too?” Will you? Some people feel very strongly about adoption for many reasons, which are generally extremely personal and require great amounts of thought. My status as an adoptee does not change this fact or process. 11. “Are they your REAL brothers and sister?” See #1, above. Also, let’s use SOME common sense. In my family, I have a 31 year old brother, a 20 year old sister, and a 16 year old brother. Three of us were adopted at 4 months old, while my 31 year old brother was 18 months old. So, I’m not a math genius, but don’t you think it might be a wee bit hard to have the same biological parents when I was living in Arizona for 15 years before my youngest brother was even CONCEIVED? By the way, none of us look even closely similar in size, shape, or color. SIGH. To sum up: I am adopted. 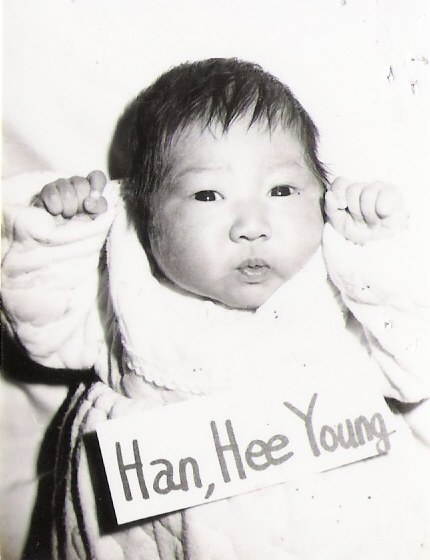 I am a person adopted from Korea, which means I was born in Korea but have lived in the United States since I was a tiny baby. When I tell you this information, it is not open license to ask completely ridiculous questions. Please use courtesy and common sense BEFORE asking your question, especially if you are a stranger. If you are not a stranger, then it’s probably okay to ask your questions, even if they are ridiculous; however, if you are a close friend, I reserve the right to harass you endlessly for asking an inane question and for making me ALAG.